We are delighted to announce some new features that you can now see on Toluna.com! Whenever a new survey has been selected for you to answer, you will be notified via a message just below the notifications tab. You can click on the ‘Start’ button to jump right in. This feature will be turned on and off depending on the type of surveys available, so keep an eye out for it! We’ve integrated a new survey strip for important surveys we think you’ll qualify for. We’ll let you know the category, title and number of points – all you need to do is click ‘Start’. 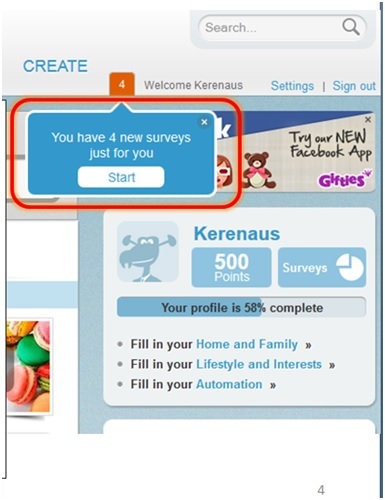 This feature will be turned on and off depending on the type of surveys available. 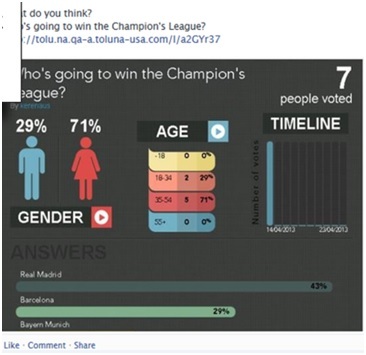 With this new feature, you can share your poll results on Facebook. Let your friends discover all the cool infographics you’ve created and they can see if they agree with Toluna users. We’re very excited to launch these new features and hope that you will like them! We’d love to hear your feedback to discover what’s working for our members.